My last week surveying for wintering raptors started slow. I spent the first day scanning for birds, finding a few Golden Eagles atop rock faces, and a Prairies Falcon fighting the wind while perched upon a greasewood. Windy it was, and the high desert landscape seemed to find little rest against the frigid gusts. The birds I saw were far, and there were little opportunities for photos. It seemed the only birds present in the high desert valleys, save the occasional raptor, were numerous flocks of Horned Lark that flushed and fought the winds. On occasion I was lucky to find small groups of Sage Sparrow. Sparrows of the desert seem to be a favorite of mine. I took a minute after a scan to sketch the bird, and after reaching home, I resolved to paint a simple watercolor. Utilizing David Allen Sibley’s field guide, I found the inspiration to emulate his prolific work and begin a more diligent effort to paint birds as I see them. Sage Sparrow- Amphispiza belli. Watercolor painting on paper. There were a few other passerines that I found. Of course the numerous flocks of White-crowned Sparrow frequented farmlands and littered fence lines. In the high desert valley of the Wah-Wah, I was able to find a few flocks of Mountain Bluebird. These strikingly blue birds set against the pale ghostly green of the sage create a subtle beauty unique to the landscape and special to my eyes. Unexpectedly I found the other bluebird of the west, in fact, the Western Bluebird. I didn’t realize how far south I was until I saw a flock of orange breasted blue birds fluttering around a canyon stream. The week went along with the second day as uneventful and windswept as the first. I was lucky enough to find myself headed to a more action packed area for my third day. When arriving at a field for the beginning of my survey, I was eager to see the numerous raptors that sat and watched for prey. The previous stint had yielded some twenty raptors in this one field. My first bird was a juvenile Ferruginous Hawk, however, the only other birds in the area were a solitary Bald Eagle, and a juvenile Red-tailed Hawk perched atop a power pole. The day began slow, and after traveling roads into the backcountry, I found myself in the midst of a white out that quickly covered the ground with snow. I was nervous that I might get snowed in, but continued. Before the roads became white from snowfall, I came upon something lying directly in my path. I always get excited when I find dead animals. I do not celebrate in the loss of life, and actually mourn those that fall victim to detrimental human interactions such as being hit by a car. Still the world is wild and animals die, and if I cross paths with an unfortunate fatality, I take full advantage at the opportunity for close study of the creatures anatomy. 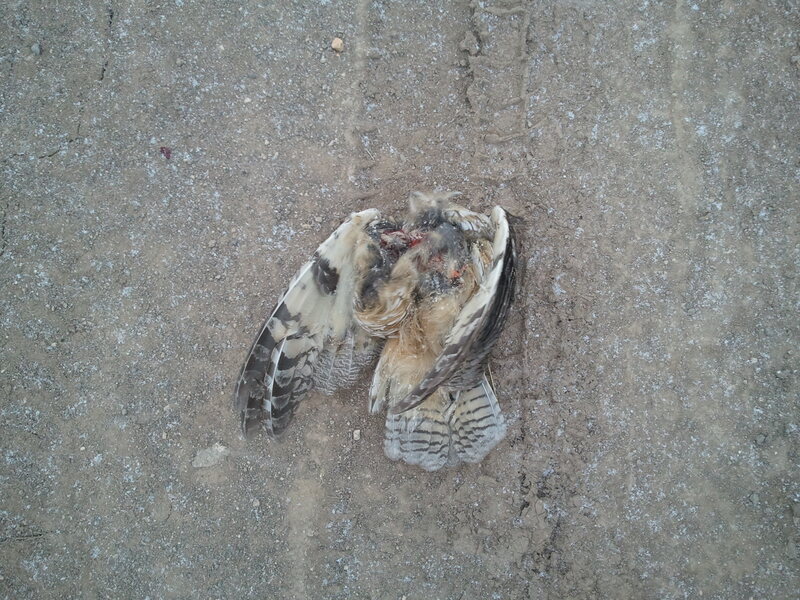 The bird I found in the middle of the road was of course a headless Long-eared Owl. I say of course because this bird is now the third Long-eared Owl that I have found, victim to predation from some fierce winged creature. The absence of the head, and the way the innards were obviously consumed leads to the avian culprit, however I admit that from there I am not so knowledgable as to come to a firm conclusion of who did the deed. I would guess that the Great Horned Owl is the killer. The bird is mean, and is a threat to many animals, even a fellow owl. My final day was spent in an area of raptor abundance. Finally I had the opportunity to use my camera. I have photographed a few Ferruginous Hawks lately, but I have failed to get a photo from below that highlighted the true plumage of the bird. 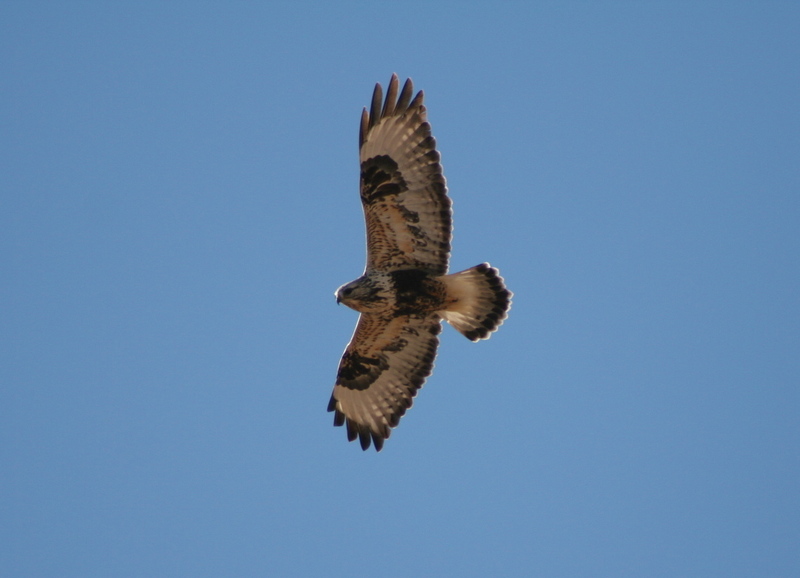 In my attempts to create my own personal library of raptor photos for reference, I lacked the proper photo of Buteo regalis. 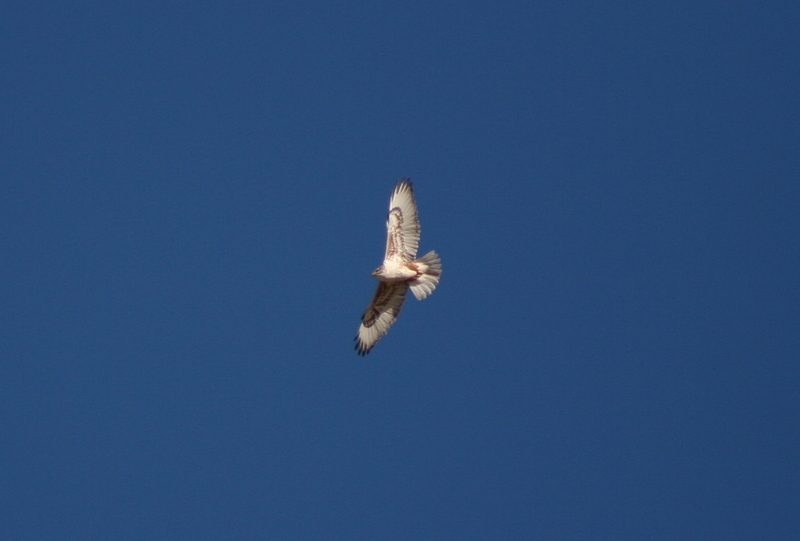 Finally, I remedied the problem as a light morph Ferruginous Hawk circled over head, cooperating enough for me to take some acceptable photos. After using Jerry Liguori’s camera the last few times I have gone to photograph raptors, it was a bit frustrating returning to my own equipment. I decided to give a go at shooting manual, and I believe it paid off. I was not able to get the quality that came from using Jerry’s camera, but I believe that I came away with some good shots. 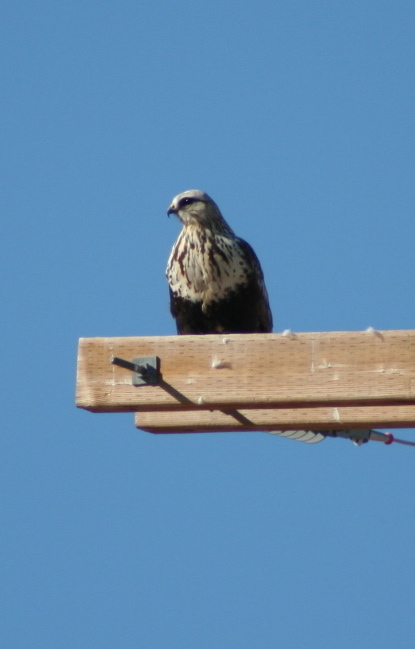 I have shared a great deal of Rough-legged Hawk photos, and they have all been of juvenile birds. Those of you that read this and have grown tired of redundant juvenile Buteo lagopus shots, I apologize for including some more. Actually, this bird is not a juvenile. I was excited to find a few individual Roughies this time around that were not juvenile birds. The first Rough-legged Hawk I found was in fact a beautiful adult male, with multiple bands on his tail and a lighter belly band. Unfortunately I was unable to photograph the bird. Adult Female Rough-legged Hawk- Buteo lagopus. Note the dark eye and pearl white head and breast, as opposed to the cream color of the juvenile. I did however photograph a very cooperative adult female Roughie. I spotted the bird from afar because of the striking contrast of the dark belly band and bright white head and breast. The lightly streaked head was unlike the juveniles I had seen, and the dark eye showed that this bird was an adult. I was excited to photograph the bird in the air, showing the dark terminal tail band and dark line on the terminal edge of the remiges. These signs indicated that the bird was an adult female. I was very pleased with the number of birds I saw on my final day of the survey. I would say the highlight of the day was actually the first bird, an adult dark morph Harlan’s hawk. I was very disappointed at failing to get a photo of the bird, but the sight itself was rewarding enough. As I drove towards the interstate to head home, a golden hue highlighted the frozen blue of the winter landscape. Alongside the road ahead, I noticed a large bird on the ground. It appeared to be eating a meal, and as my vehicle neared, the large bird took to the air. I fired a number of shots, and stopped to watched the bird as it circled high in hopes that I would move along. 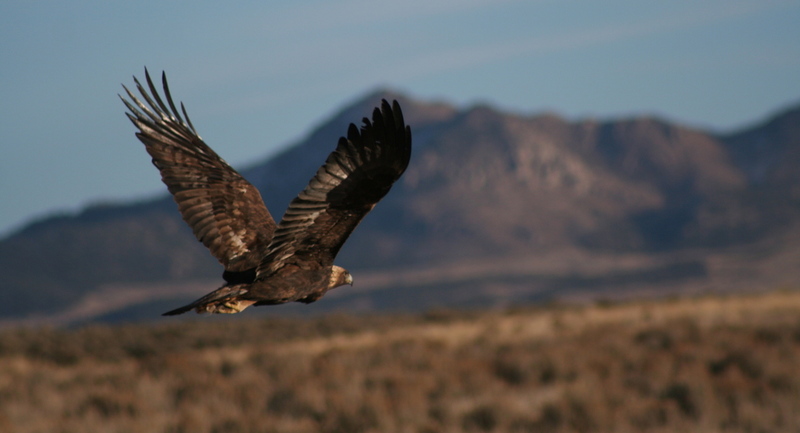 The large creature was a Golden Eagle, and the setting sunshine against its golden brown plumage created a sense of peaceful beauty in my soul. Curious at what the birds meal was, I investigated and found that I had interrupted a Golden Eagle feasting upon a wild Coyote. What a wonder and a symbol of the ferocity and harsh nature of the winter world. I have no way of knowing how the canine met its end, but regardless, the image of the eagle feasting upon another fierce carnivore, coupled with the finding the headless Long-eared Owl gave me a sense of sobering mortality. The sun seemed to send me along my way north. As it set I pondered. It seemed to be a chapters end in my life. With the end of the winter surveys I am now to continue south to California, where I will undoubtedly find many adventures and learn more and more about the wonders of the wild world of birds. The retreating Golden Eagle, full of Coyote flesh. A symbol of my chapters end. 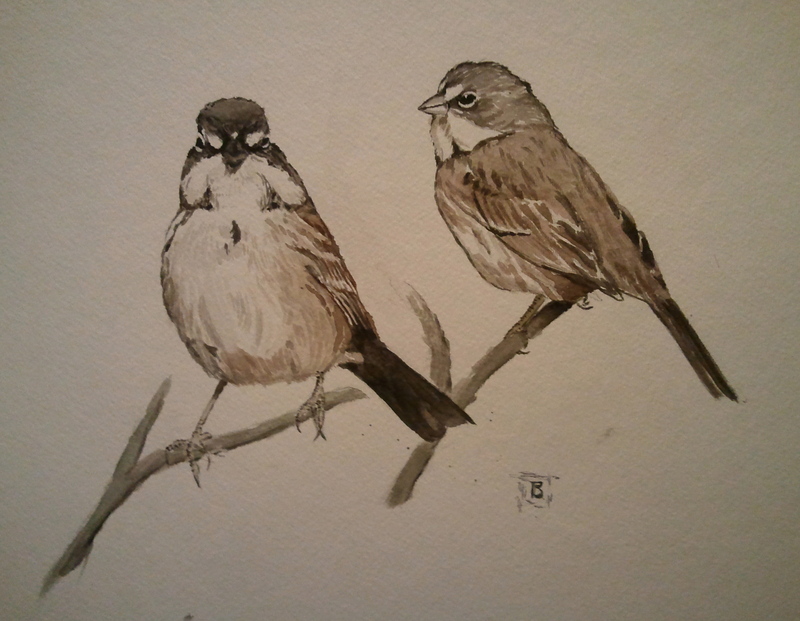 the sage sparrows are delicate, yet bold. your narrative is useful and great reading. we have many mountain bluebirds here in Kamloops, B. C. They’re nurtured and encouraged by way of special nesting boxes on fence posts. That is great to hear of the nest boxes, and thanks for the compliments. I can see that you are a seasoned watercolor artist. I welcome any suggestions you have for me. Please . . . I was about to ask you the same thing! All-in-all, the medium itself teaches us more than any person can. I have found, though, that the biggest help was finding my paper. It took me a good ten years to discover that I do best using Arches Hot Press 140 lb. Hot Press is extremely smooth and makes for tremendous detail when doing a bird’s feathers, etc. It’s not for everyone, but I respond well to it. I don’t know if you’ve given it a try or not–or if you have a paper suggestion of your own to offer? Oh I certainly wouldn’t know. I am a very amateur painter with very little experience. I still need to explore materials and such. The paper suggestion is very helpful. I have found success lately as I travel through mediums, and lately I am stuck on watercolors. Thanks for the tip, I will surely explore some things.